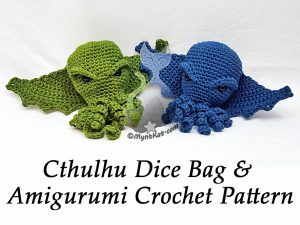 This entry was posted in Blog, Crochet and tagged amigurumi, bag, buy, crochet, cthulhu, dice, download, drawstring, pattern, tentacles, wings. Bookmark the permalink. The pattern comes with two downloadable files, one with the text and a second with the pictures. I see that now.. Sadly, I bought it through ravelry, and for some reason I just.. CANNOT seem to get it to indicate I bought it… I can show you where my paypal indicates that I paid, if you might be willing to email the file to me? I’m trying to get it made for a gift exchange later.. I got ravelry to take care of it. Great! You should be able to download all patterns you bought from your pattern library in your profile. Hope you enjoy the pattern!